It’s halfway through National Craft Month! Recently I’ve been crocheting my little fingers off in preparation for posting a few items on my Etsy store and in preparation for this blog’s FIRST EVER GIVEAWAY! One of the most frequent questions I get is what kind of crochet hooks I use and prefer. I actually am spoiled. A few years ago for Christmas the Man bought me hand turned wood crochet hooks. 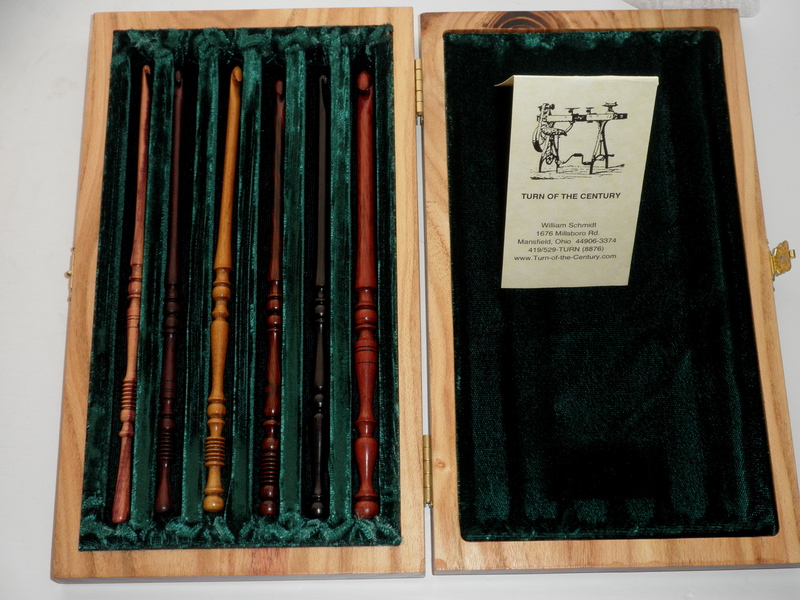 They’re made by Turn of the Century, and each one is a different kind of wood. 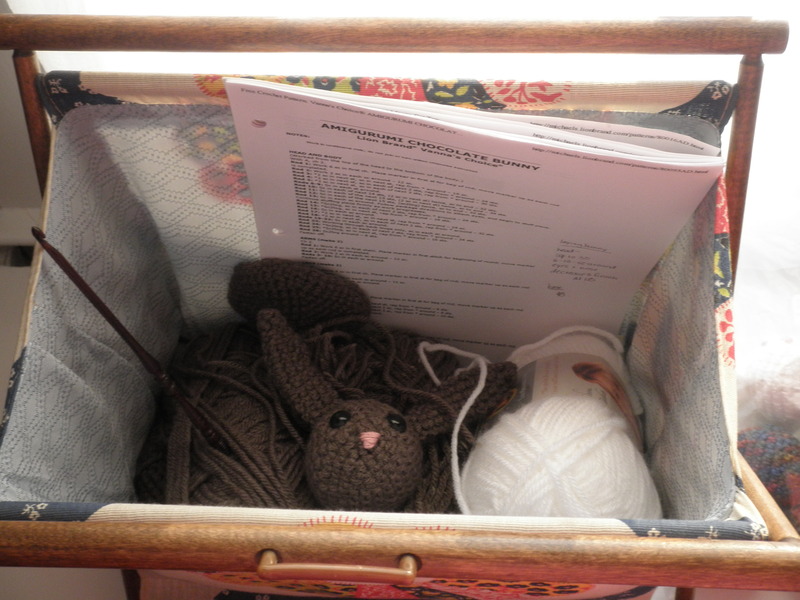 For amigurumi, I tend to use a “G” hook which is made out of Kingwood. 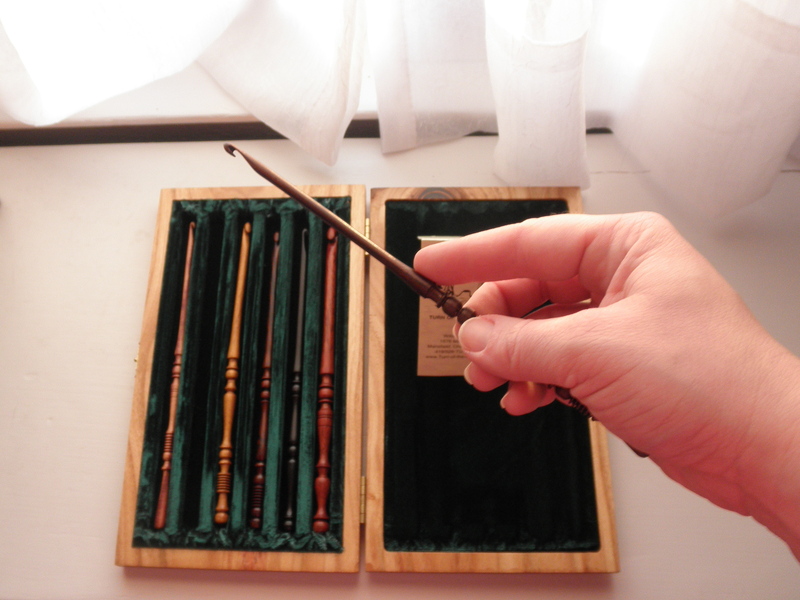 One of the side benefits to these is that I feel like I have my own set of Harry Potter wands. I also recently scored an amazing find at a thrift store. For $6.00, I snagged this fabulous old “knitting” bag. 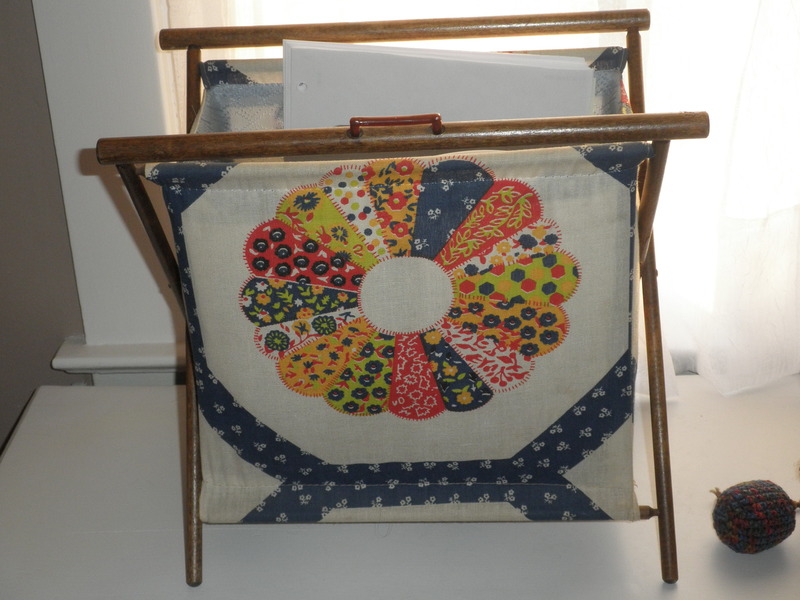 The fabric is funky, but it is absolutely sturdy and holds my hooks, my current critters, and about 6 skeins of yarn! While I certainly make scarves and blankets, my absolute favorite crocheting projects are my amigurumi. Most of my patterns are found online, but I recently starting experimenting with my own. Once you get the hang of how the increases/decreases work, the options are endless. So, without further ado, the giveaway! 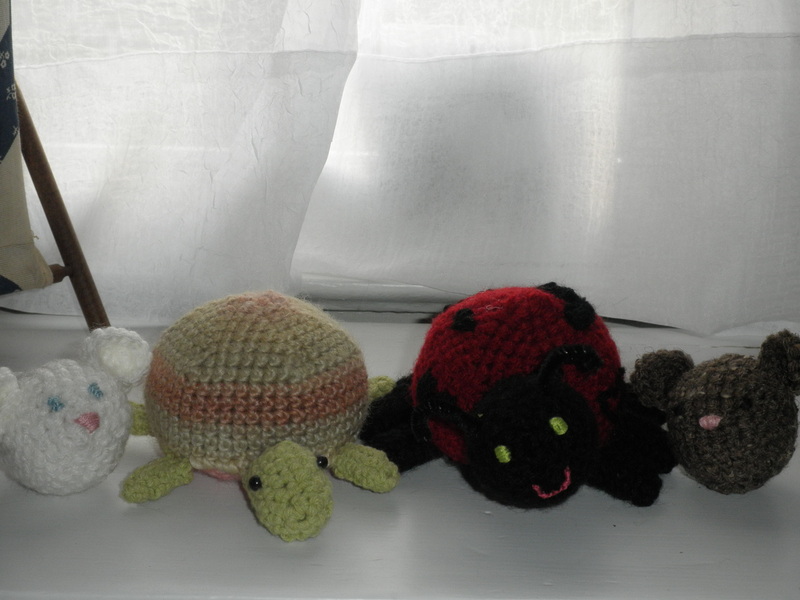 Two lucky readers will win an amigurumi of their choosing! 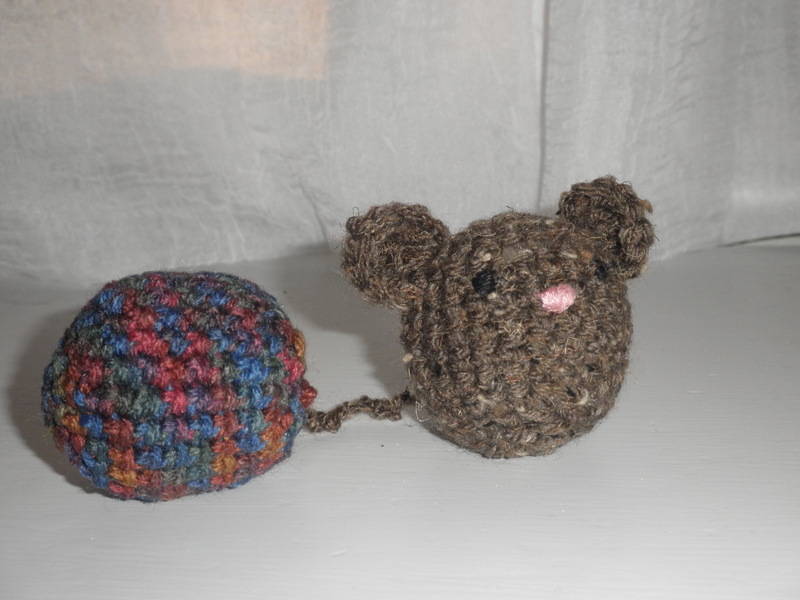 Choice #2: Cat Toys – Mabel Mouse and catnip ball. Both stuffed with catnip! All you have to do is comment on this blog (by scrolling to the top and clicking “leave a comment”) and, in honor of national crafting month, tell me one thing you love to craft or would love to learn how to craft. Two winners will be selected March 31 using a random number generator. Make sure you enter your email correctly when commenting so that I can contact you! You’ll get your choice of Tabitha or Mabel mailed to you. 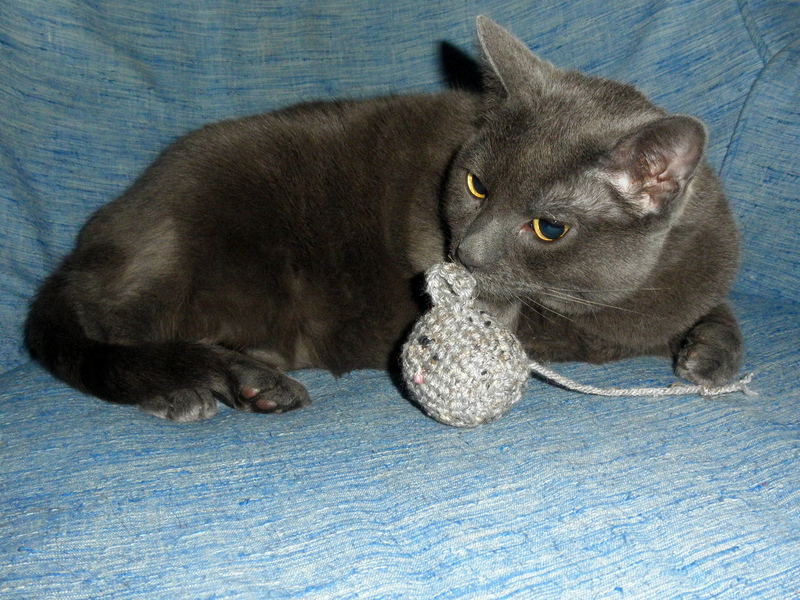 So, with just over two weeks left of crafting to go, I’ll leave you with a picture of my catnip mouse prototype tester. Happy commenting! don’t worry – she’s trained. I love eating crafted goodies made by John…. very very much so….. I craft precision paper punching implements which are a joy to utilize. This is awesome and amazing…such talent. 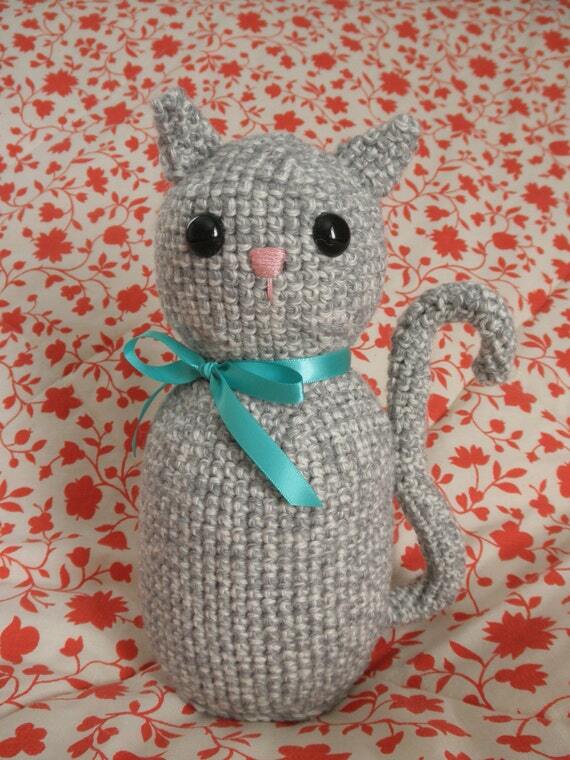 I think Kitty would love some homemade toys!!! 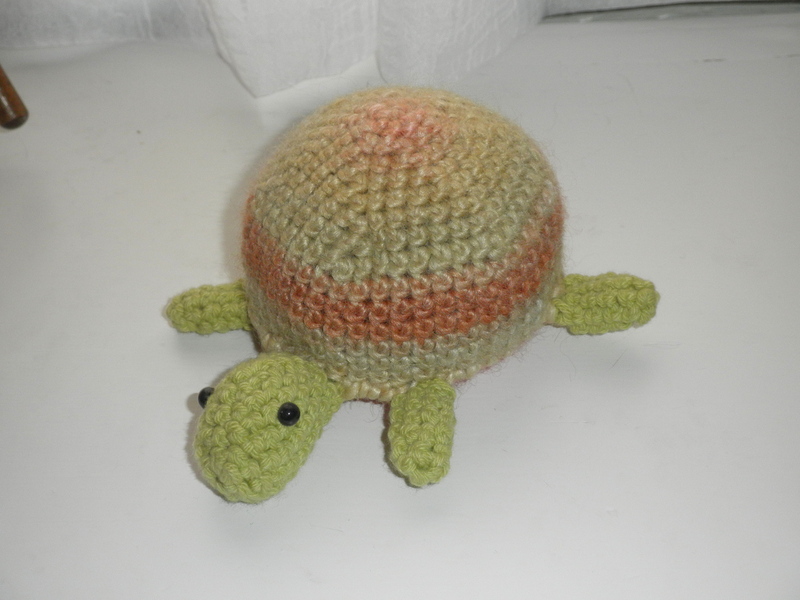 Your Tabitha turtle looks so cute! Happy National Crafting Month! Hello! 🙂 In case you didn’t receive my most recent email, I replied requesting if you could send it to the address I had originally gave you, the one with “Kimono”. Thank you again!